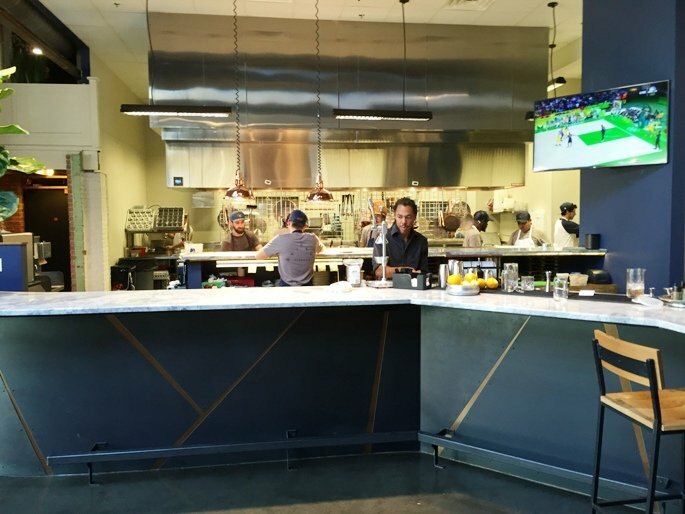 A recent flurry of activity in downtown Raleigh has seen the openings of Dram & Draught, the Parkside, H-Street Kitchen and NOW Whiskey Kitchen! And while I like them all, Whiskey Kitchen sticks out in my mindscape as having the most potential as a bar-restaurant. I really didn’t know what to expect when I stepped into Whiskey Kitchen for the first time but it was a wonderful and neat surprise! 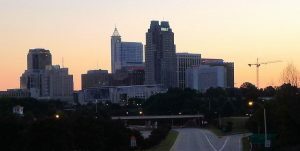 Especially given the lengthy build-out of this space, it was well worth the effort and wait, Raleighites. 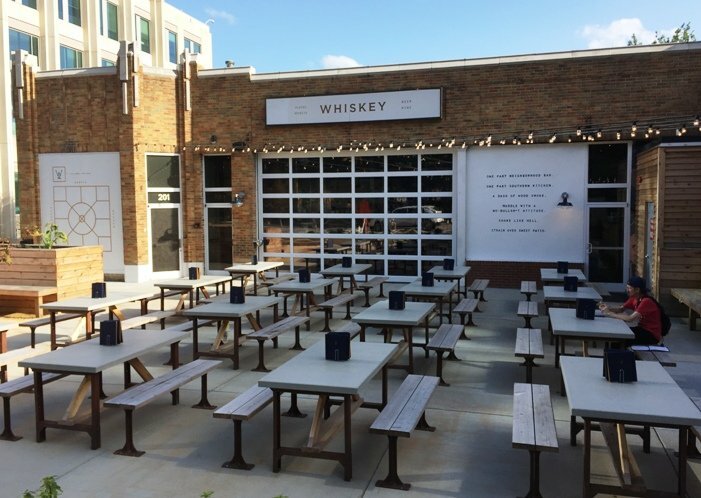 From the outside, Whiskey Kitchen looks similar to many of the recent additions to Raleigh given its large cement patio, populated with picnic tables (think State of Beer). Roll-up garage door, some lights strung overhead, you’ve seen this all before. But pop open that front door and you’re about to be wow’ed. Located in what used to be White Horse Transportation, Whiskey Kitchen opens up into a large, cavernous space with a huge bar to the right, complete with mod white-black mural, a main dining area and lounge area in back. The place is humming when I stop by on a Wednesday evening. I grab an old-fashioned at the bar and learn that the seating here is all first come, first served with wait service all around. Taking a closer look at the space, the community table theme continues inside but with smaller 4 to 6 person tables. Overhead is a large peaked skylight for natural sunlight and it’s all laid out on a lovely, polished concrete floor. 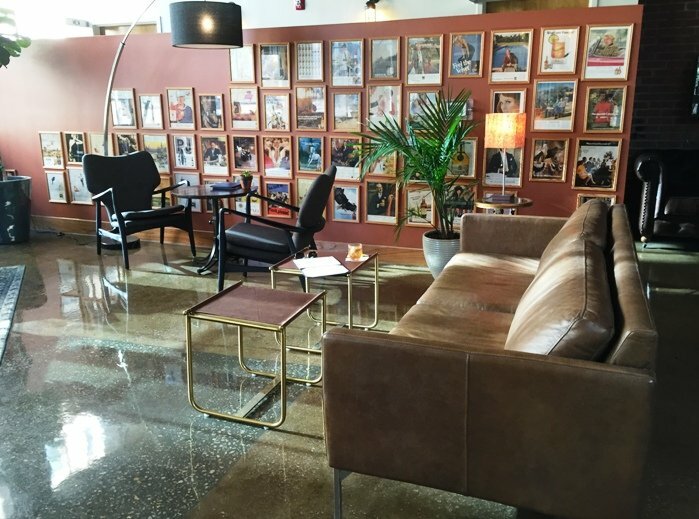 I head on over to the back lounge area which is its own neat little nook, complete with stuffed leather couch and retro adverts from over the years. It’s got a refreshed 70’s feel to this corner which is fun. Whiskey Kitchen plays a bit of music but it’s at the right decibel level, supporting the size of the space without overwhelming conversation. 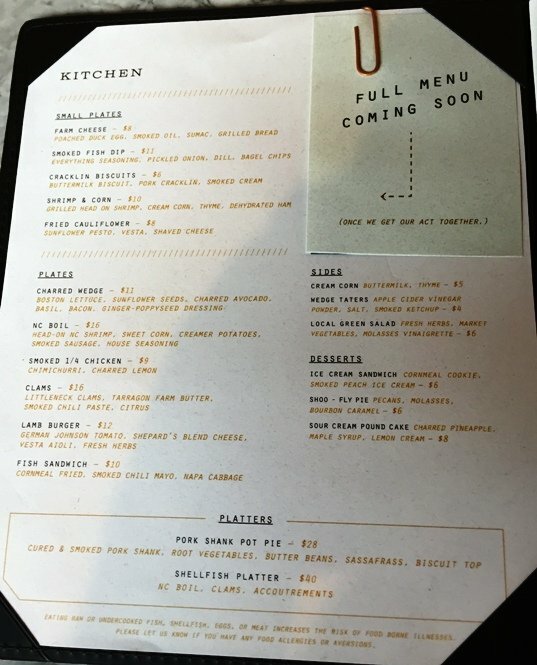 The menu here at Whiskey Kitchen is pretty short right now in their opening week. 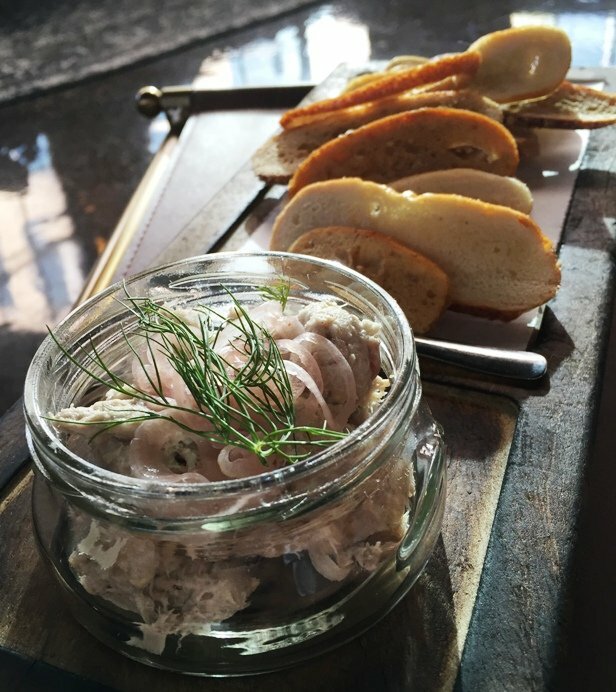 I order up the smoked fish dip to start with and it’s beautifully presented with some toast rounds and short mason jar of fish with thinly sliced onions and a sprig of dill on top. They’ve used local bluefish here and it tastes like a lighter version of lox, good stuff on a hot summer evening. And the littleneck clams are served up beautifully in a double layered aluminum container (2nd container for shells). Steamed and roasted with some chili paste and citrus. 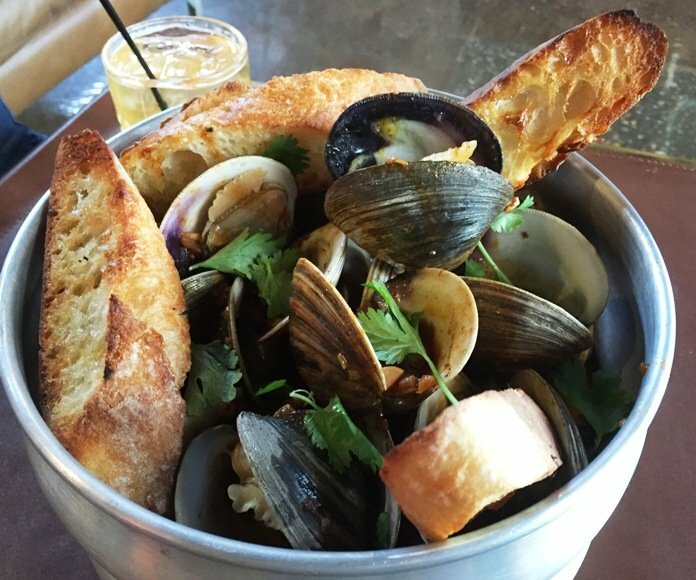 I like the fact that they’re going with clams over mussels but the preparation doesn’t quite blow me away from a flavor standpoint. 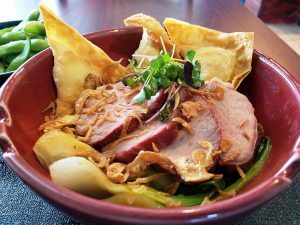 But not to worry, Whiskey Kitchen will be expanding their menu shortly, once they hit their stride. I’m very curious to see what they come up with. The menu is currently more of a gourmet, farm-to-table flavor right now. But let’s give a slow round of applause to Whiskey Kitchen! What a great concept and well-executed right from the start. The space is well-appointed and has a great feel in terms of decor, lighting and even the acoustic environment. The menu is tight and focused but off to a good start. And the service was great for opening week. 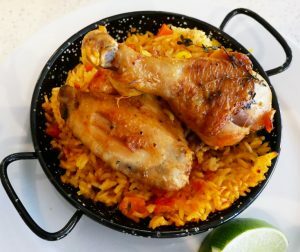 The one common theme I see in new restaurant openings in the Triangle is that they are much better prepared for the crowds that they tend to draw. 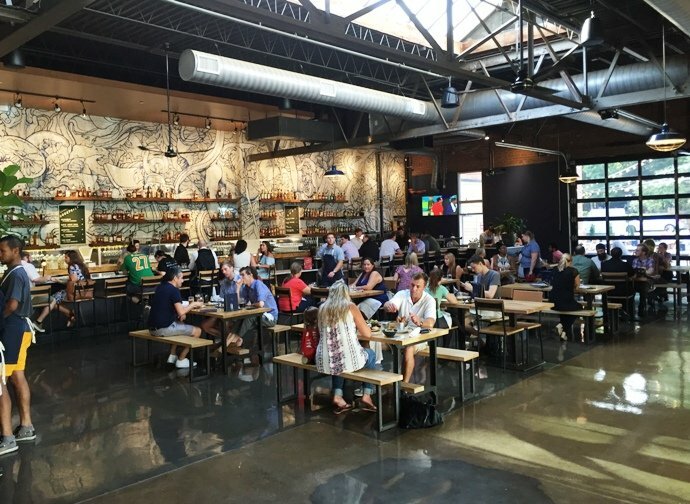 Raleigh is growing up quickly and places like the Whiskey Kitchen are one of the neat reasons why there’s so much excitement to the area. Kudos!